So who knew that all you had to do to make 205 Live better again was to get rid of Enzo Amore? Not because Enzo was terrible, per se—he is, but that's not the point—but because whoever's in charge of writing the show tended to use him and his charisma as a crutch, piggybacking on his magnetism and focusing the whole proceedings around what he did and didn't do. The whole Enzo experiment could have been better and much more hardworking. But it wasn't, and now they don't have him they suddenly remembered that they had other cruiserweights in the division. So there's a power vacuum at the top, both in the Cruiserweight Championship picture and a new General Manager for 205 Live coming next week. There's a whole bunch of ways they can go about this. First, let's address the need for a GM. It didn't have to be a new guy, but I did want an authority figure running the show to have a sense of structure. Some will argue that the show doesn't exactly need it (because it's really a division under RAW—unless we make clear that 205 Live is really its own entity and it's just a RAW blocktimer) but rules create structure, and the structure creates drama. I need logic to dictate why things happen, even if the show has historically done a good job of establishing who gets a title shot and what. But who gets a shot at a title shot? A GM could help organize the chaos into something more sensible, done right. As for the title, because they're not doing anything special for Royal Rumble (no over-the-top-rope battle royals for the vacant title) it's in their best interest to do a mini-Cruiserweight Classic. Or, you know, just have a tournament that's not 32 guys deep and still call it this year's Cruiserweight Classic. It makes sense, because all of a sudden everyone's wrestling like they were in the Classic right now. 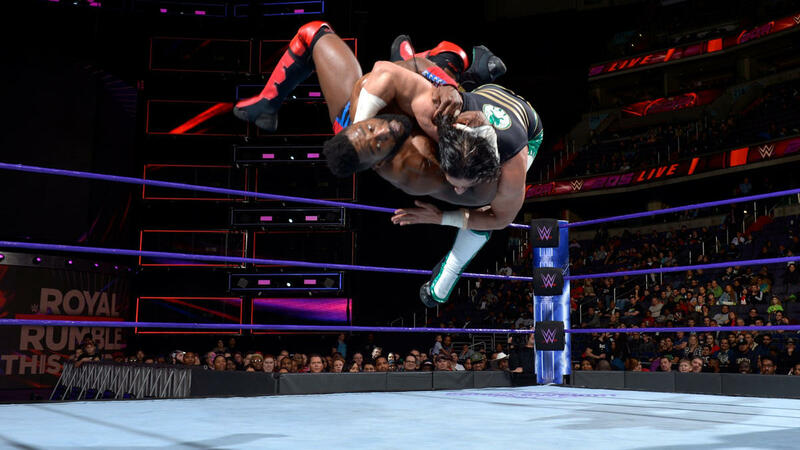 This week's hot main event of Cedric Alexander vs. Mustafa Ali is an inspired bit of cruiserweight wrestling that's been missing for quite a while now, which does well enough to mask the fact that the whole show's writing is still pretty rigidly patterned. The boys are out there trying their damndest again, because now Enzo's gone it feels like they've got a chance to make it on sheer talent—not just by how controversial you can be. As for my pick to become the next Cruiserweight Champion? Let's give it to Cedric Alexander already, but not this current Cedric Alexander. The guy's been wrestling like a champ in this recent main event run against Enzo, and he's been showing some flashes of a hot-stuff attitude that could definitely rub some people the wrong way. Let him win the title, have him become more arrogant, turn him into a franchise player a la ROH-main-eventer Jay Lethal, and have all the underdogs go up against him. Pair him up with an effective mouthpiece and a heel Alexander could be golden. What's next for the cruiserweight division truly is exciting, now that the fat has been cut out. I just need the writers to remember that the division isn't just six or seven people, and we'll be good from here on out. TJ epitomizing the common Filipino's behavior—blame everyone else except yourself when things go south—is great right now, whether he realizes that he's being a Filipino or not. I hope they make him explain his new persona and flesh it out some more. The videos of Gulak and Tozawa campaigning to be the new GM—which I don't want to be a current roster member, by the way, because it technically takes away opportunities from hardworking wrestlers—goes a long way in making the show feel less formulaic, because you find little spots for guys who aren't wrestling to fit in every week. Do this more. I dig Hideo's new GTS variant, even if it's not as impactful. It's a very puroresu finisher, no doubt, but the fact that it's a knee to the face regardless makes me happy. It's just gonna need a little more time to stick. I also hope that this Hideo/Gallagher match is the end of the feud. It would be timely, too, considering the current title situation. Mustafa Ali could really be a good babyface against a former friend heel in Cedric Alexander. At this point, Cedric's become the establishment even though he hasn't won a title yet—role reversals from 2016, where Cedric had to rally after being sent home early in the tournament. Cedric Alexander — Who else? The guy is still technically the #1 contender to the title, so in a perfect world he'd be the champ right now, or at least one-half of whichever title match there'll be. Cedric's proven why he's the undisputed top guy of the division right now, reestablishing just how good he is in a Cruiserweight Classic-caliber match to main event this week's episode. Gran Metalik — Yes, you read that right: Metalik's at #2, mainly thanks to the hot streak he's also been in against a downsliding TJP. It also doesn't hurt that he's a winning mainstay on Main Event. Hideo Itami — Itami gets the spot a step below Metalik simply due to match volume. Metalik's just done more, while Itami's been kept away from Jack Gallagher a little bit. If there's gonna be a tournament for the title, he's the best bet to be the second finalist against Cedric. Drew Gulak — Drew hasn't done much lately, but it's good to remember that he's pretty much the #2 contender after Cedric, and his shadow looms large over the division as the next possible 205 Live GM. Don't sleep on the Drew Train, because in the vacuum he's still technically the division's #1 heel. Kalisto — The Lucha Dragon has also been kept away from competition a little, which puts him in the middle of the pack. But he's doing well right now, despite the company's reluctance to build around him as a top star of the division. TJP — Is clearly going somewhere, putting out amazing performances but just falling short. It's only a matter of time before he explodes and gains some upward momentum. Jack Gallagher — Tried to mount some momentum, but had to be fed to Hideo Itami. Mustafa Ali — On here because of this week's decent performance, but has to find a way to compete more. I doubt that that won't be a problem in the coming weeks, however. Tony Nese — Confusing back-and-forth story over the past month, but is still getting some looks. Ariya Daivari — Pretty much an afterthought, but less so than Lince Dorado.